Gastro-oesophageal reflux disease (GORD) is defined as symptoms or complications relating to reflux of stomach contents into the oesophagus. Most patients experience dyspepsia such as heartburn, but a proportion of patients are asymptomatic (Hopper 2015). GORD is common in asthma, and particularly so in people with severe asthma, with reported prevalence rates from 17-74% (Heaney et al. 2010, Moore et al. 2010, Schleich et al. 2014, Shaw et al. 2015). A proportion of patients may also have silent reflux without any symptoms, such as heartburn (Harding 2003). Conversely, asthma medications may induce or aggravate GORD, thus creating a potential vicious circle (Sweeney et al. 2016). Proposed mechanisms of how GORD may trigger asthma are micro-aspiration, acid stimulation of the oesophagus and vagal nerve stimulation, although evidence is somewhat conflicting (Ayres et al. 1996). The diagnosis of GORD may be difficult as both pH monitoring and endoscopy have limited sensitivity (Naik et al. 2015). Hence, a trial of treatment with PPI is recommended as the initial diagnostic step in symptomatic patients (Naik et al. 2015). 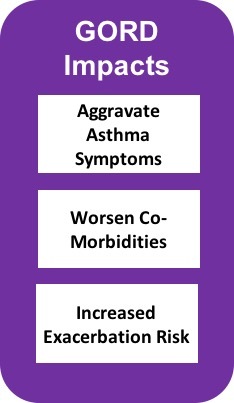 The effect of treating GORD on asthma related outcomes is controversial. While there is no convincing effect on objective outcomes such as lung function and airway hyperresponsiveness, some studies show effect on symptoms, quality of life and exacerbations (Gibson et al. 2003, Kiljander et al. 2013). This may suggest that symptoms triggered by GORD mimic asthma symptoms, rather than exacerbating airway inflammation or airway hyperresponsiveness. There are no predictors of the effect of treating GORD in the individual patient (Gibson et al. 2003). Acid suppression should be considered in patients with significant symptoms of GORD, with careful monitoring of the effect, whereas asymptomatic patients are generally unlikely to benefit from a trial of acid suppression.